By now VUCA is common language for the Volatility, Uncertainty, Complexity, and Ambiguity of business. The term originated at the US Army War College to describe the changing conditions on the battlefield, and its wider usage now serves as a call to action for all those who wish to be more agile and effective in an increasingly complex global world. How should we prepare the workforce? It would be a mistake to lump all aspects of VUCA together, as volatility calls for a different response than ambiguity. Yet, when it comes to developing employees who perform effectively in the midst of the unplanned and unexpected, there is a universal need to shift the way we prepare the workforce. Most employee development strategies assume a stable future and that the skills and knowledge learned today can be readily applied to tomorrow’s conditions. VUCA challenges those assumptions and urgently calls for new approaches and strategies to develop employees at all levels of the organization who can learn and adapt in changing contexts—in other words, employees who are not only agile but are learning agile. Recent research on learning agility, as well as lessons from those preparing for such diverse roles as those on SWAT teams; and improv troupes, can guide us in developing a more agile workforce. Rather than develop competence and confidence to execute a set plan or follow a script, agile individuals train to be effective in the midst of the unexpected and unplanned developments and are prepared to adjust in rapidly changing conditions. For most businesses and their employees, this represents a significant shift, one I have come to call the Agility Shift. It begins with a shift in mindset and follows through to a shift in how employees make decisions and the actions they take. For film crews, SWAT, and improv teams very little of their ability to think on their feet comes from classroom training or their formal credentials. They develop their agility competence and confidence in hands-on and often high-stakes situations. Similarly, helping employees develop their agility competence and confidence requires a shift away from traditional approaches that rely primarily on pre-planned curricula, delivered via a range of onsite or online channels toward more informal learning strategies, where 70-90% of workplace learning takes place (Kim, Hagedorn, and Collins et al., 2001). Most business schools and training programs are effective in helping people analyze data, develop and execute a plan. They are less successful in helping them quickly turn unexpected challenges into opportunities, or improvise with available resources. VUCA conditions require a shift away from an over-reliance on the plan, to one that focuses on preparing employees to think on their feet and be confident in their ability to respond to the unexpected. Improvisers don’t rehearse, because of course, there is nothing to re-hear, but they do regularly get together to workout by playing games and improvising new scenes. SWAT teams similarly prepare for hundreds of scenarios, which not only expands their repertoire of responses but also their individual and team confidence when they encounter the completely unexpected. In my work with organizations, I discovered that the agility shift also requires employees who can quickly tap their web of relationships and resources, or their “Relational Web,” to respond to new challenges and opportunities. Information is, of course, still valuable; its value, however, is realized through the interactions between and among employees as they make sense of what is happening, and then decide, and take action based on their sense-making. Researchers Beckey and Okhuysen’s study of film crews shows the value of the Relational Web, which includes awareness of available resources, a social-professional network, as well as past experience. On a film shoot, time is money. With hundreds of variables on any given day, from the weather to equipment failure to illness, everyone on the crew must be prepared to adapt, switch roles, and make optimal use of available resources. The time to discover and build this Relational Web is not in the midst of a crisis but through their day-to-day interactions. This third component of the agility shift has significant implications for employee development, and even organizational structure. Agile teams and organizations do not miss opportunities or slow their response time because they are waiting for approval, or waiting for someone with the correct job description to become available. Like their improvising counterparts in the theater, they communicate, coordinate and collaborate in the present moment. This means shifting the focus of employee development from narrowly defined skills and knowledge to creating what IT consultant Scott Ambler calls “generalizing specialists” (2014) who can communicate, collaborate, and coordinate whenever and with whomever to respond to unpredictable challenges and opportunities as they arise. In addition to the mindset and strategy shift described above, the agility shift also requires that the responsibility for learning and employee development be shared across organizational roles, especially by the employees themselves. This means helping employees become more learning agile. Just as healthy people don’t abdicate responsibility for their wellness because they have access to doctors, we don’t want our employees to give up responsibility for their learning and growth because the company offers training resources. Learning agile employees take responsibility for their own learning. They are not only effective at thinking on their feet, but they are also able to quickly tap their prior experience to be successful in new and unfamiliar situations. This ability first gained the attention of Morgan McCall, Michael Lombardo, and Ann Morrison in the late 80s when they studied the significant learning experiences of more than 190 executives. They found that the key to success within a complex organization was the ability to manage something new without having to master it first (McCall, Morgan, and Lombardo, 1988). Learning agility is now widely cited as a critical success factor for long-term leadership success (De Meuse, Dai, and Hallenbeck, 2010). Coach employees to seek out stretch opportunities. Studies of successful executives highlight the value of taking on new roles that stretch employees outside of their comfort zone. These can include expanded responsibilities, a broader scope of current responsibilities (e.g., from managing a team to a full department, or a distributed global team) and/or working in a new culture. You don’t need to be a software developer to experiment with some of the concepts of agile methodology. Many organizations, such as Ericsson, are using lessons from agile methodologies throughout their organization to shorten product development time and increase profits. Rather than develop a detailed plan upfront, agile developers collaborate with their customers (who may be internal) to agree on the objectives and prioritize product features. They then move into action in short work cycles to get working versions of the product (idea, project) into the hands of the customer or end user as soon as possible to test, setting in motion an action-feedback cycle that greatly reduces the implementation time. Shifting your employee development strategies must include a shift in how and what you recognize and reward. The best success indicator for the agile employee is not only whether or not they meet their sales goals or implemented the strategic plan effectively, but it is also how effective they are when things didn’t go as planned, or when they are thrown into a new situation with little or no preparation. By including indicators of agile performance in your evaluation and recognition programs, you will reinforce the mindset and behavior shift needed for success in a VUCA world. 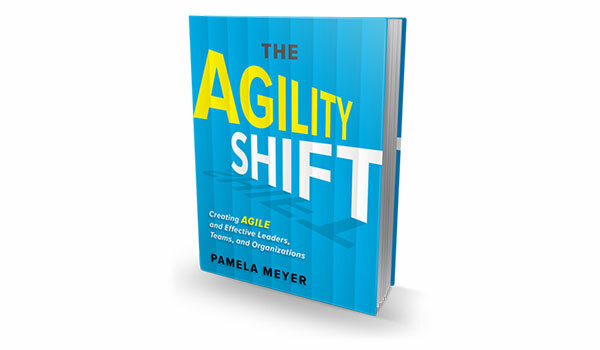 The ideas in this article are adapted from my latest book The Agility Shift: Creating Agile Leaders, Teams and Organizations. Bennett, Nathan, & Lemoine, G. James. (2014). What VUCA really means for you. Harvard Business Review, 92(1/2), 27. Kim, K., Hagedorn, Collins, Williamson, J., & Chapman, C. (2004). Participation in Adult Education and Lifelong Learning: 2000–01. Washington, D.C.: U.S. Department of Education, National Center for Education Statistics. McCall, Morgan W., Lombardo, Michael M., & Morrison, Ann M. (1988). Lessons of experience: How successful executives develop on the job. Lexington, MA: Lexington Books. Mitchinson, Adam, & Morris, Robert (2012). Learning about learning agility. Greensboro, NC: Center for Creative Leadership, Teachers College Columbia University.